Chartered by US Congress in 1864, the Northern Pacific Railroad was given large grants of land to build a railroad between Lake Superior and the Puget Sound. The company was eager to find buyers for land along the railway so Northern Pacific set up recruiting offices in the United States and abroad. Their efforts were particularly successful in England where increasing poverty and unemployment in agricultural areas made emigration to America look particularly appealing. Reverend George Rodgers was a minister from Yeovil who believed that labourers and tenant farmers in Somerset and Dorset needed to earn higher wages and deserved a better quality of life. The Northern Pacific Railroad hired him to give speeches to groups of farmers to tell them about the benefits that life in America had to offer. 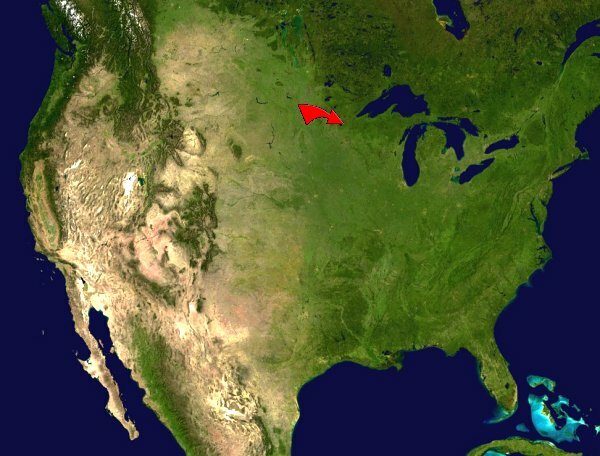 Although Rodgers may not have meant to deceive immigrants, his praise did mislead prospective buyers about the land available and the level of existing settlement in the Red River Valley. Reverend Rodgers said that the colony site in Minnesota was ideal and, for less than a year's rent for an English farm, a settler in the colony could buy an entire farm of his own. Rodgers predicted high crop yields, wealth and happiness for those who settled with him on the Minnesota prairie. 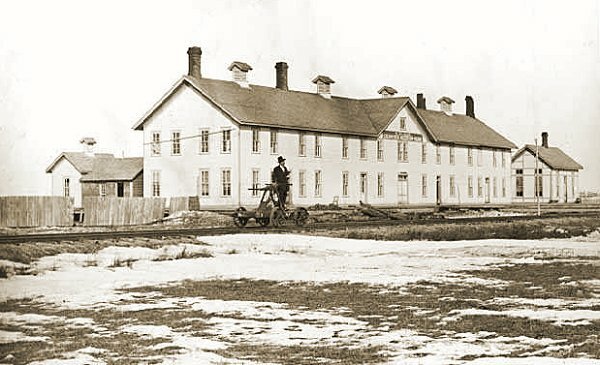 In 1873, George Rodgers led immigrants from southwest England to establish the New Yeovil Colony in the Red River Valley on land purchased from the Northern Pacific Railroad. Despite high hopes, the settlement of New Yeovil crumbled soon after it began. 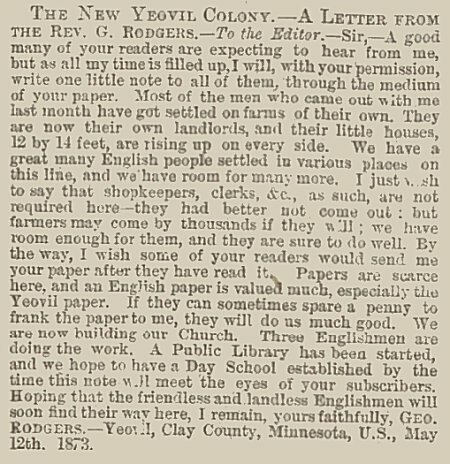 Rodgers and the first group of colonists arrived in Minnesota on 17 April 1873 and established New Yeovil on railroad land near Hawley. However, the colonists were dismayed to find that the lots available were much smaller than advertised and double the price. Dissatisfaction with the colony grew and Rodgers urged colonists who were not farmers to remain in England. Nevertheless, he insisted that dissatisfaction in New Yeovil was a result of the colonists' poor planning and unwillingness to work. By the time a third group of colonists arrived in June, many of the original settlers were leaving and by October 1873 half the original colonists had already left. By the following year most the colony of Yeovil was gone. 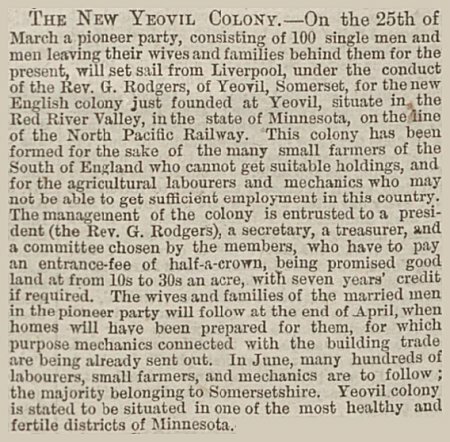 The New Yeovil Colony, an article that appeared in the 31 January 1873 edition of the Western Gazette. A letter from the Rev Rodgers published in the 6 June 1873 edition of the Western Gazette. The Northern Pacific Railroad's colonist's reception house, Glyndon, Minnesota, 1876. New Yeovil was roughly where the red arrow is pointing.